You may not have heard yet, but Neolith countertops are one of a new breed of countertop materials called “ultra-compact surfaces” making a splash for improved performance over other favorite surfaces. Neolith is a product of a Spanish company called TheSize started in 2009 by professionals from the natural stone industry. TheSize began producing the Neolith ultra-compact surface in 2010. What Are Neolith Countertops Made Of? Like Dekton (a competing brand), Neolith countertops are made with 100% natural materials. Granite compounds, natural oxides, glass, and silica minerals are combined through a process of extreme heat, pressing, and sintering into one of the most resilient surfaces available. The raw materials are similar to those used to make glass, porcelain, and quartz countertops but the specific combination and process are what gives Neolith its strength, hardness, and durability. 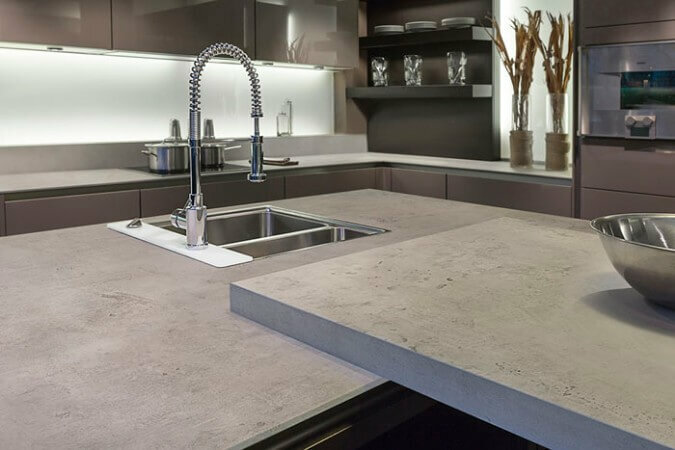 Natural oxides are used to provide the Neolith countertop colors while glass and silica minerals provide chemical stability and resistance to damage from chemicals and cleaners. The high-pressure sintering process makes the slab very dense and non-porous, so no sealing needed and it is essentially stain-proof. Neolith can withstand high or low temperatures from hot pans or freezing (when used outdoors) without scorching or cracking from thermal shock. Just as with all types of kitchen countertops, there are some things that you will love about these countertops, and there are also some problems that you can encounter. Difficult to handle during installation and easy to accidentally crack the surface and damage the edges. Neolith is very tough once installed and supported, but during installation, it is much more tricky to work with than granite, quartz or other countertop materials. Finding skilled countertop fabricators willing to work with Neolith slabs can be difficult. Many refuse. Slab colors may not match since a specific Neolith color shade can vary depending on the dye lot. Overhangs like bar tops are limited to only 6 inches. Neolith can be scratched by ceramic knives but nothing else, although, the "polished" finish is more delicate and susceptible to abrasion. You can choose from about 30 Neolith colors in a range of whites, grays, blacks, and browns. Note that even though Neolith is man-made, the color match can vary depending on the manufacturer’s dye lot. 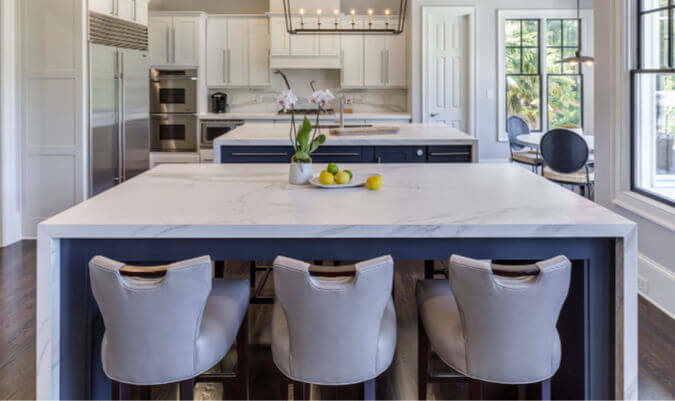 This is important for you to consider when updating your kitchen as you will want to buy all the Neolith that you need at once to complete your remodel. Finishes come in silk, natural honed, satin, river washed, and polished. One drawback is that the “polished” finish tends to be far less resistant to scratches. Knives and abrasives cleaners can scratch or dull a polished Neolith finish. And ceramic knives can scratch all finish types. Edge styles are more limited than with other types of countertops, but you still have attractive edge options to choose from when installing new Neolith countertops. Minimalist edge is when the edges are eased and honed, which then look a little rounded and very smooth and won’t have sharp corners. This creates a contemporary style and showcases how thin the material is. Mitered edge is made with a short apron to mimic the thicker edges of granite and marble. Waterfall edge runs from the countertop surface down to the floor cascading down the cabinets creating a luxurious look that is very sophisticated. Slab sizes range from 2.5 ft. x 2.5 ft (750mm x 750mm) up to 10 ft. x 5 ft. (3200mm x 1500mm) and can be cut to any size or shape needed. The large-format slabs cut down on the number of seams needed and make it easy to cover large kitchen islands or long countertop runs while maintaining a cohesive look to the pattern. Like most people, you’re busy and don’t want to spend time worrying or fussing about how to take care of your countertops. Thankfully, cleaning Neolith countertops is simple and doesn’t require any special cleaners. Hot water will work for most cleanups but avoid soaps or detergents that contain waxes (many do) as these will leave a film on the surface. Puracy cleaner is an excellent choice for Neolith or use a quality quartz and granite cleaner for a streak-free shine. You can get the Neolith cleaning guide here. Deeper cleaning may be necessary immediately after installation to remove any cement or joint compound left behind by soaking with hot water. Any dry or encrusted food on the countertop can be removed by first soaking it with water and a mild detergent and then wiping it with a damp cloth. Avoid abrasive scrubbers and cleaners on the “polished” finish. In truth, Neolith surfaces are very scratch-resistant and essentially scratch-proof except for the “polished” finish. Do not use acidic cleaners on a newly installed Neolith countertop as the acids may damage the glue used in the joints. Do not use ceramic knives on the surface. Ceramic knives are the kryptonite of ultra-compact surfaces and will scratch all finish types of Neolith. The total installed cost of Neolith is similar to mid to high-end granite countertops and/or quartz countertops. Expect to pay $60 - $105 per square foot installed. Some say Neolith is cheaper than quartz or granite, but on average this is not the case. Although, quartz is becoming more expensive now that tariffs have been imposed on the importation of quartz slabs from China. And granite prices have dropped over the last 10 years so many granite colors can be installed for less at around $45-$65 psf. It is difficult to get an exact cost for Neolith without specifying what color, slab size, and thickness you want. Costs for Neolith vary from $10 to $30 per square foot (material only) a few years ago to $24 to $40 sq. ft. more recently, which means that prices are increasing slightly. You may be able to cut the cost of your new Neolith countertops by choosing a thin 6mm slab (normally for flooring or wall cladding) and installing it over the top of an existing countertop. This is something you’d need to discuss with an experienced Neolith installer as the thicker 12mm slabs are recommended for kitchen countertops. You’ll save a nice chunk of money on the overall project cost. However, thinner slabs are more susceptible to damage (cracking and chipping). As noted in the pros and cons above, Neolith and all ultra-compact surfaces are particularly vulnerable to damage prior to installation. Once the countertops are installed, they are very stable and durable. 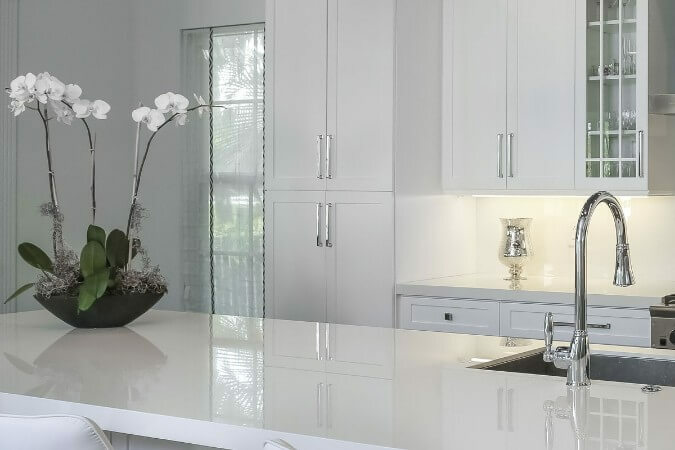 However, this countertop material is thin which makes it challenging to transport, cut, or move around without cracking or splintering the slab or chipping the edges. Some argue that because Neolith is so thin and lightweight that it is much easier to cut and install which is undoubtedly rational, however, that is not how it plays out in reality. It’s so hard and thin that it is a bit brittle when unsupported and that’s why it presents some unique installation issues. Now granite can crack during installation too, but Neolith and ultra-compact surfaces have a much bigger problem with it. Because of this, it is not a favorite with countertop fabricators. Many fabricators will simply refuse to install it or any other ultra-compact surface brand. Also, Neolith is not widely available so you may have to be more persistent in your project planning when getting a Neolith countertop installed. On the plus side, the thin Neolith slab can be installed right over the top of other types of countertops. This can save you a little money not having to tear out your old countertops. While quartz countertops are made in a similar fashion, the Neolith countertop has advantages over quartz. Neolith and all ultra-compact surfaces were designed to improve upon the weaknesses of quartz. Neolith countertops are cured to incredibly high temperatures (2191 degrees Fahrenheit) and cannot be burnt or scorched by hot pots and pans. Quartz is only cured to 200 F, thus it can be scorched by hot pans. Quartz is highly susceptible to UV damage causing the color to fade. Thus, quartz cannot be used as an outdoor countertop. Neolith colors do not fade and make great outdoor countertops. Quartz countertops are non-porous and resistant to acids and staining but can be discolored permanently by several different types of household cleaners. Neolith is also non-porous and stain-resistant but is much more resistant to chemical damage and will not be discolored by cleaners. Quartz countertops have far more color choices than Neolith. Granite countertops are like the “gold standard” that all other countertop materials are measured by. Even though granite is not perfect or without its own problems, most man-made countertops are trying to create a surface that performs as good or better than granite or has some unique feature or look that granite doesn’t. When comparing Neolith countertops vs. granite, we see that Neolith holds up well. Granite has excellent heat and scratch resistance. Neolith is also highly heat and scratch-resistant (except for the “polished” finish which can be dulled by abrasives or scratched by knives). Granite will not be damaged by acidic foods, drinks, or chemicals, except by industrial-strength acids or repeated exposure. Neolith is also resistant to chemical etching or damage. Granite is porous and can be stained. Sealing is needed on most (but not all) granite colors. Neolith is non-porous, doesn’t stain and does not need sealing. Granite can crack under extreme temperature changes or heavy impact. Neolith may also crack with a heavy impact but is highly-resistant to cracking from temperature changes. Granite may develop small pits and can be chipped. Neolith will not pit, but it may chip especially on the edges. Granite has thousands of colors - Neolith only around 30. Some say Neolith countertops are revolutionary and they certainly do have several advantages over other types of countertops. However, it has some drawbacks as well and just goes to show you how hard it is to make a perfect kitchen countertop material. Alas, none are faultless. Neolith is very durable, heat-resistant, stain-resistant and scratch-resistant except when using ceramic knives on the surface or abrasives on the "polished" finish. It does not crack easily, but dropping heavy objects on the surface could cause a crack. Neolith countertop colors are limited at this time, but modern and attractive with several finish types and edge style options. The large-format slabs allow for fewer seams and a more cohesive pattern overall. It’s easy to clean without special cleaners but, you cannot use abrasive cleaners on the polished finish. All other finish types are okay for this. A skilled fabricator with experience installing Neolith countertops is a must since this material is more fragile when cutting and installing than other surfaces. All considered, the Neolith ultra-compact surface definitely gives granite and quartz a run for their money and can be a solid choice for your kitchen countertops once successfully installed.